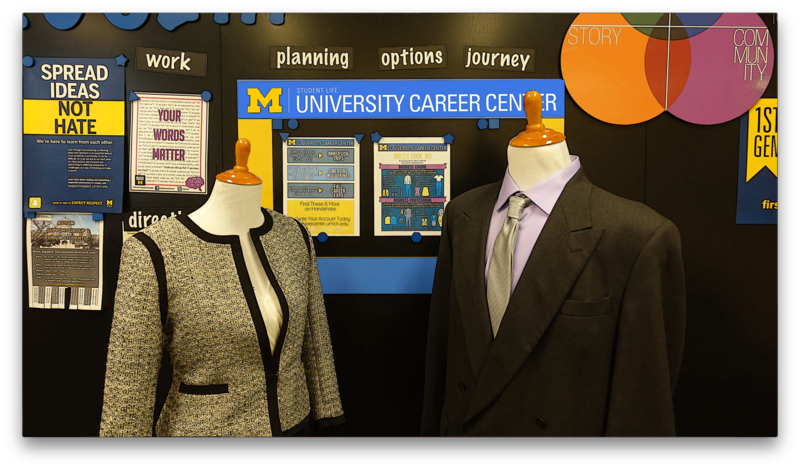 A program established that allows U-M students to obtain business casual and business professional attire from a wide selection of clothing donated by U-M faculty, staff, and alumni as well as other professionals from the community. Students also receive tips on how to dress to impress and build their professional brand! Are you planning to have an interview, internship, or start your first professional role? The University Clothes Closet has you covered! Come in for an appointment to select business professional and business casual clothing at no cost to you (Free Clothes!). Items we provide include full suits, dress shirts, skirts, blouses, ties, shoes, and more. Students are allowed to select up to three items. Schedule an appointment time at University Career Center's Clothes Closet. Looking and feeling your best is important, whether you're working on building your professional wardrobe or preparing for upcoming interviews. We have appointments to browse the Clothes Closet that you can reserve through your Handshake account. Do you plan on interviewing for an internship or full time position? Plan on attending a networking event? Select business professional and business casual clothing at no cost to you (Free Clothes!). Items provided include full suits, dress shirts, skirts, blouses, ties, shoes, and more. Closet events are a large scale version of our appointment hours. These events are open to all University of Michigan Students and typically take place before the Career Expo. Clothes Closet events are a great chance to come the Clothes Closet during a walk-in setting--no appointment necessary! At high traffic times, there may be a 30-minute wait. Come stop by and get prepared for the next career expo or your next interview. Want to help support the University Career Center's Clothes Closet? You can host a bin in your office and help us stock our Closet. We will drop off and pick up a bin that your office can host from 1 to 2 weeks. We appreciate any and all help! Your contributions really make a difference for students -- your donations allow them to dress for success! If you are interested in hosting a bin, please fill out the form below and our Clothes Closet Coordinator will reach out to you with more information and marketing material. Thank you! Monetary donations are also welcomed. Funds from monetary donations are used to fill any existing gaps in the Closet inventory to ensure students have the best experience in developing their professional wardrobes.